In response to a point made by Prof Koh that society is becoming more stratified, Mr Tharman said Singaporeans are not as class-conscious as people in many other countries that he is familiar with, and that it should strive to maintain this attitude, and made a call for mixing across social classes. In closing the dialogue, Prof Koh recited the lyrics to Bob Dylan's Workingman's Blues, a song about the plight of blue-collar workers. Responding, Mr Tharman referred to a 1960s hit by British group The Hollies: "I can't resist adding - what should always be in our mind is, he ain't heavy, because he's my brother." The Institute of Policy Studies (IPS) held a conference - Diversities: New and Old - last Friday. 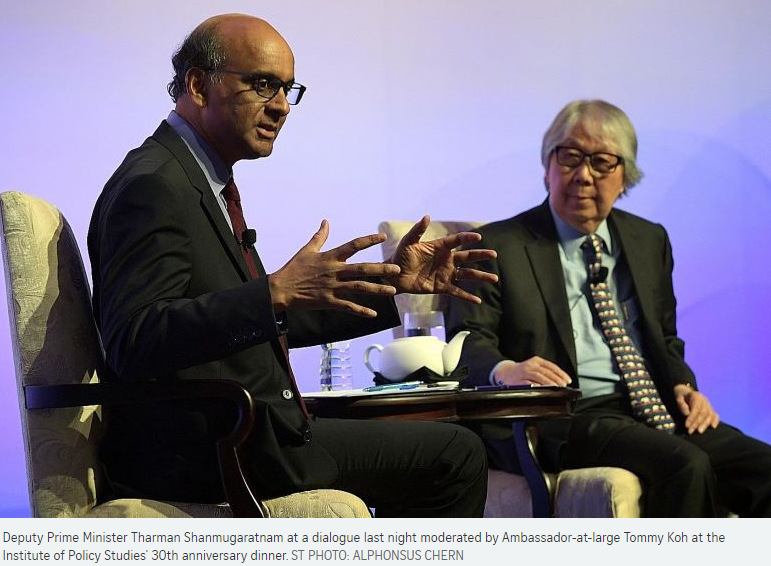 Below is an edited transcript of the dialogue between Deputy Prime Minister Tharman Shanmugaratnam and Professor Tommy Koh, IPS special adviser, at the pre-conference dinner last Thursday. 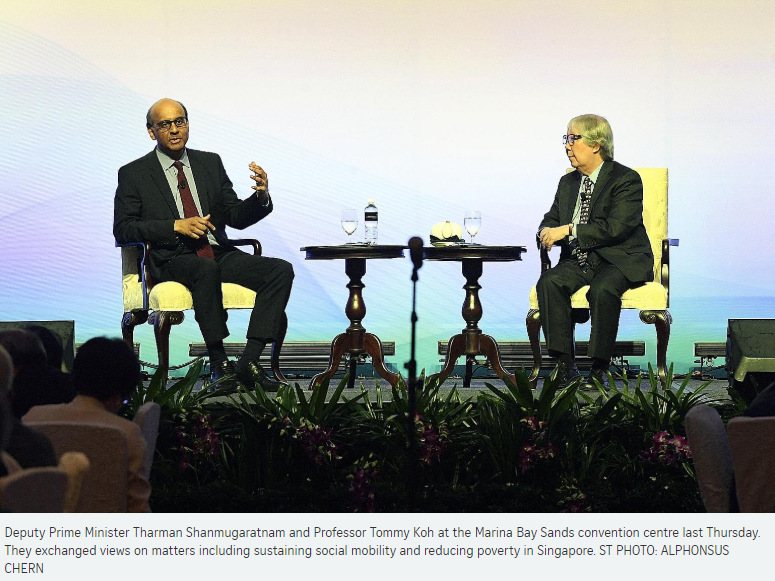 DPM Tharman: Inequality is important. Social mobility is even more important. Social mobility is at the heart and soul of our ambition. Not just in Government. It must be our ambition as a society. It has been part of our identity, it is part of our identity, it has to be part of the heart and soul of our ambition for the future. It is critical that we sustain a system where everyone is moving up. In other words, before we think about the issue of relativities, which is what inequality is about, we have to first think about how can we make sure that everyone moves up, including those in the broad middle of our society - the middle class. Because once that escalator stops, once the escalator that carries everyone up stops, the problems of inequality and all the problems of "me against you", "this group against that group", become much sharper, and this is what has happened in a whole range of advanced countries. Once you get stagnation in the middle of society, over a long period of time, which is what has happened in the United States and a range of other advanced countries, inequality becomes a much sharper issue. Much more brittle. And the politics around inequality acquires a momentum of its own which makes it harder to solve the problems of a broken escalator. Once that escalator stops, it becomes a very salient issue: Who's ahead of me, who's behind me, not just who's ahead of me and moving farther away from me, but who's behind me and catching up with me. This, too, is what we see - in a range of advanced countries - that pervasive anxiety of people in the middle as someone is catching up with them and someone above is moving away from them. Second reason we've got to keep that escalator moving for everyone is that it makes it much easier to have social mobility with a moving escalator. There are more opportunities, there are new skills to be learnt, new jobs to be obtained. In other words, it becomes much easier to achieve relative mobility when you have absolute mobility. What I get is not just at the expense of someone else; I can move up without someone else moving down, if the escalator is moving up. Singapore has done relatively well on that score so far, because our median wages, and the wages of those in the bottom 20 per cent, have been moving up, unlike many other societies. The second point I want to make has to do with social mobility itself: It will get more difficult, it is already more difficult and it will get more difficult, precisely because we have succeeded in the past - because we've had waves of mobility, from a population that largely started off poor, like many in this audience, start off poor, did well in education, worked hard, did well in life. So those who were poor, or those whose grandparents were poor, had parents who were not so poor, and they themselves now are no longer poor, or are in fact quite well off, they invest in their children as much as they can so that their children can do well. It's in the nature of a meritocracy, it's in the nature of succeeding in social mobility, that it gets more difficult over time, because those who succeed try to help their children and those who haven't succeeded find that the odds increase against them doing well in life. It means that we have to work harder at keeping mobility going, by starting earlier in life, in fact starting even in the prenatal months, before a child is born. Starting very early in life and continuing through life, to intervene to help people to do well for themselves. It requires a consistent effort in early childhood, through the school years and in work life, investing in people at regular intervals and taking very seriously the idea that everyone can grow. That growth mindset has to be what defines us. It doesn't matter where you start, you can grow, you can improve and you can master your job. This is a major challenge, very few countries are succeeding. I just came back earlier this week from Denmark and Finland - both relatively egalitarian societies, culturally, and in their education systems - but they've seen social mobility far short from what they desire. In fact, the persistence of social class in even the Nordic societies has been remarkable over the decades - and they are the most egalitarian of the Western societies. We, too, will face these challenges. We are doing better than most societies for now in terms of mobility, but we're going to face more of a challenge and we have to focus our minds on that. The third point I want to make is that we have to remember that a good part of inequality in Singapore is actually generational inequality. I'm not even talking about the pioneer generation. Even if you talk about those in their 50s today, say aged 55 and above. Among working Singaporeans aged 55 and above, the majority, in fact, over 60 per cent, have no more than secondary school education. But we succeeded in transforming education and transforming opportunities for subsequent generations - those born later. And that has led to a generational inequality. Those who started earlier with limited education by and large took simple jobs, worked hard, their pay has gone up over time - in real terms, it is much better than in the old days. But they are now at the lower end of the escalator and subsequent generations have moved up. That was a by-product of success, success in transforming our society, but it has led to generational inequality. We have to focus our minds on how we can help older Singaporeans, mature Singaporeans who still have 40 years ahead of them. Those in their mid-50s, those in their mid-60s. To work for as long as they wish, to work with dignity, to earn a decent pay, with the support of their employers, with the support of the government, and with the support of the public so they are treated with dignity. Just before I came up, I had to go to the loo. I met a gentleman there, who was holding himself with pride with his uniform. He was the attendant in the gents. We had a chat, I was struck by how good his English was. He started working here eight years ago - a full-time job, all the benefits, started off with $1,200, now earning well above $2,000. His employer had sent him for training, including English language training with Kaplan, even had to sit a test on a computer. He was working as an attendant but was very pleased to have a chat. He was doing his job with dignity, earning a decent pay that goes up over time, and with an employer that takes him seriously and invests in him together with his teammates. That's what it takes. Prof Koh: DPM, the important question is not whether he behaves with dignity, but whether people who enter the lavatory show respect and treat him with dignity. Prof Koh: And I would say in Singapore, the elite does not show respect for people who work as cleaners, gardeners, petrol station attendants, security personnel. One of the problems in Singapore is that these low-wage workers are treated as invisible people. You are one of the few gentlemen who greet him and talk with him. But how many of you did? DPM Tharman: I think ageism is still an issue in our society and ordinary blue-collar workers also deserve a lot more respect. I don't think this is only a problem for the elite. It is part of our social culture. We inherited a combination of British institutions and an East Asian culture, both of which are quite hierarchical, both of which tended to look down on ordinary manual labour. We've got to move beyond that and it means everyone - it means customers, it means ordinary members of the public, it means employers, employers play a critical role - and with the support of the Government. Prof Koh: My first question is about inequality and I would challenge your premise that inequality is a generational problem. You know, the old people like me fade away from the scene, the problem will disappear. It will not. Singapore had become increasingly stratified. We are unequal not only in wealth, income, occupation, housing type, the school you went to, the way you speak. As Janil Puthucheary's documentary showed us, we live in a very class-conscious society, but I want to draw three things to your attention. One, the United Nations Development Programme's (UNDP) well-respected Human Development Index describes Singapore as the second-most unequal high-income economy, after Hong Kong. On Oct 9, Oxfam published its annual report on commitment to reducing inequality. Oxfam was very critical of Singapore, demoted us from 69 to 140-something, put us in the bottom 10 countries of the world. I think it is a very unfair report. But two days later, the World Bank published its first Human Capital Index, and the World Bank ranked Singapore No. 1 for the development of human capital. My question to you is, how do you reconcile the UNDP's index that says Singapore is the second-most unequal advanced economy, Oxfam's report on us, and the World Bank's very salutary report on Singapore. DPM Tharman: Let me start by saying that I disagree with Tommy that we are one of the more class-conscious societies around. In fact, I would say that if you talk about our social culture, we are much less class-conscious than many other societies I am familiar with, partly because we are younger. We are at risk of becoming more class-conscious, and we must resist every tendency in that direction. I just want to mention that point. Second, I didn't take the Oxfam survey very seriously, not because of its conclusions. It is just that it was not very good; it was very weak, methodologically. I am someone who takes data and methodology very seriously. I don't want to spend time criticising it here. By most conventional measures - the most conventional one is the Gini coefficient, named after an Italian statistician called Gini - before you look at government taxes and subsidies or transfers, Singapore does not have an unusually high level of inequality. In fact, quite apart from the US which has a high rate of inequality, quite apart from the developing world - China and some others have much higher levels of inequality - even among the European countries, several including the Nordic countries have a higher rate of inequality before taxes and transfers. They redistribute more, but they have very high taxes for the ordinary person - the ordinary person will pay something like 30 per cent income tax and about 25 per cent VAT (value-added tax). Because they do not have much savings, the VAT of 25 per cent is actually an income tax because you are consuming most of your income. So it is roughly a 50 per cent tax on the ordinary person. In our case, there is virtually no income tax for the person right in the middle. You pay GST (goods and services tax), 7 per cent and moving up by 2 percentage points in a few years' time. If you own a car, you pay significant COE (certificate of entitlement), ARF (additional registration fee) and so on. But overall, taxes are far lower on the ordinary person, including the middle class and the lower-income group, than in any other advanced country. Only Hong Kong is in the same league but Hong Kong is living on borrowed time - the property market has been doing well, but Hong Kong is going to be an ageing society like us and they are going to need revenue just like we need revenue. We are a low-tax society, and as a result we have to think very hard about how we use those tax revenues. What we do is to use it very progressively. In other words, target our subsidies and our benefits on the poorest in society, on those who need it the most. The impact of doing this is not very large on the Gini coefficient. But we have a low-tax regime that is highly progressive in terms of where the benefits go. So if you are someone at the bottom 20 per cent of incomes, for every dollar of tax you pay, which is mainly GST, you get back about $4 of benefits. It is a very progressive scheme. That is our system. Where does it end up - after taxes and transfers our Gini coefficient is something like 0.36 (by the Organisation for Economic Cooperation and Development's methodology) for those who are familiar with this - which is not at the top end of the advanced economies; it's certainly in the top third but not at the very top end. But critically, I come back to my first point. What matters is not just the relativities, but are people doing better over time? It is no point in being better off than someone else if in fact everyone is stuck in the same place. We have fortunately avoided the situation where you have middle-class stagnation and where the lower-income group is also stuck. Everyone has been moving up. The escalator is still moving and we have got to keep it moving, which is why economic policy is fundamental to social objectives. It's not just social policies, not just redistribution. Economic policy itself is central to our social objectives. How do we reconstruct Singapore for a disrupted world, as ESM (Emeritus Senior Minister Goh Chok Tong) put it in his speech? It's fundamentally economic policy, and if we can do that well, we keep the escalator moving for everyone. Prof Koh: I think your basic point that upward mobility continues to be strong in Singapore is a good point and I agree with that. Inequality and poverty are related but they are not the same. So do you mind if I ask you a question about poverty? If we take per capita income, I think we are one of the five richest countries in the world, but there are many poor people in Singapore. There are two kinds of poverty - households that live in absolute poverty, meaning that they lack the means to pay for basic human needs, and families that live in relative poverty. The concept of relative poverty derives from taking 50 per cent of their median income as the yardstick. Households whose income is below 50 per cent of the median income are considered relatively poor. From the research I have done, I found that there are between 100,000 and 140,000 households living in absolute poverty. According to (Education Minister Ong) Ye Kung, 15 per cent, but from my research it looks like between 20 per cent and 35 per cent of our households living in relative poverty. So my question to you is, what are the facts that you have about poverty in Singapore and what can we do to reduce the poverty in Singapore and make sure that people are able to live in dignity and material sufficiency? DPM Tharman: I share the aspiration that Tommy has laid out - we've got to make sure that everyone can live with dignity, at work as well as in the community, and see their lives improve over time. There are poor people in Singapore. There are some who are trapped in poverty. Our challenge is to help them escape that situation - they themselves, their children, and with the support of the community and the Government. And this is a task - it's not an ideological task, it is a practical task. We have got to find every way possible to help them to escape poverty, and to ensure we do not get a persistence of poverty across generations. There is a risk of that happening. There is a risk of it becoming entrenched and passing on from one generation to the next. So we've got to work very hard at it, and it is not an easy task because I know of no societies that have actually succeeded. There have been many attempts, particularly in the last 60 years since the 1960s, in the US, in the United Kingdom and in Europe. If it is merely a question of redistribution, it improves your Gini coefficient but it doesn't get people out of poverty. So how do we get people out of poverty? How do you shape social culture for the better? How do you raise aspirations among the young, even if their parents or their uncles and aunts don't imbue it in them? It's a task. It involves teachers, empathetic principals, it involves peers, getting into a positive cycle of aspirations rather than a negative cycle among themselves, it involves all of us. So we have to work harder at this task and prevent poverty from being entrenched. The numbers who live in absolute poverty are much smaller in Singapore compared with elsewhere because our whole society has moved up. And we only have to remember what it was like in the old days. I am not as senior in years as Tommy is but I grew up in the 1960s and early 1970s. I actually remember vividly what it looked like. At today's prices, the pay of an average person when we became independent in 1965 was about $550 - it was actually much lower than that (in nominal terms) but I've inflated it for today's prices. For a lower-income person in those days it was even lower. The lower-income person then, compared with the lower-income person today, was very much poorer. For those in the bottom 20 per cent, the increase in the standard of living, adjusted for cost-of-living increases, has been about five times - they are five times more better off now. There are people who are struggling today, but think of where we came from. It has been a dramatic transformation. So we have progressed, but we still have problems. The problems that will always be with us are the relative problems, because you always have a proportion who are less well off than the others. I would not say that is irrelevant. It is relevant. We don't want relativities to get too wide because it affects the tone of our society. Prof Koh: There is a new challenge in Singapore - this is the challenge of growing intolerance. A mutual friend of ours was recently invited by one of our religious organisations to speak at a conference on a secular topic. He accepted, prepared his paper and then he was disinvited. Why was he disinvited? Because he signed a petition to repeal the 377A. You know, we can disagree, but there is no need to demonise each other. And I would make also a plea to the Government to show greater tolerance. I hope that going forward, the Government will no longer ban movies, withdraw book grants. Let's be big-hearted. We have reached a stage of political and cultural maturity where we could accommodate different points of view. It is a plea. DPM Tharman: No one should feel demonised in Singapore. We are a diverse society, we have to respect each other and make sure that whatever our views on specific topics, there is a solid core of shared aspirations and beliefs that holds us together. As Singapore goes through rapid social and economic changes, the need for a strong policy research body becomes all the more pertinent, Emeritus Senior Minister Goh Chok Tong said yesterday. Such an organisation will enable the country to harness all possible ideas and solutions to fix present and future problems, he added. This was the underlying reason for the setting up of the Institute of Policy Studies (IPS), a think-tank ESM Goh established in 1988 when he was the deputy prime minister. But even as it continues over the years to play a vital role as a platform for Singaporeans to contribute ideas and hold a mirror up to the Government, ESM Goh is envisioning a new role for the institute. 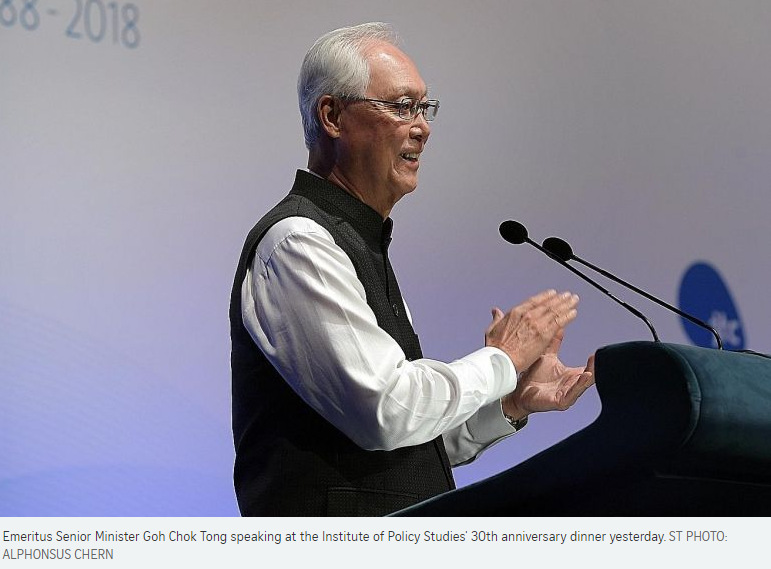 Speaking at IPS' 30th anniversary dinner, he said he wants it to work in tandem with the Lee Kuan Yew School of Public Policy (LKYSPP) at the National University of Singapore to "advance the special case study of Singapore". That is, they should combine their resources and insights in helping foreign students and officials understand what makes Singapore tick, how it has achieved so much in such a short period, and how it is able to maintain good governance beyond its founding leaders, he added. As the founding patron of IPS and chairman of the LKYSPP's governing board, ESM Goh said he hopes his suggestion would carry some weight, although it should still be deliberated. His call comes 10 years after the IPS became a research centre of the LKYSPP in 2008. While it was done then with the understanding that IPS would function "more or less independently", ESM Goh said there is great potential in combining their strengths. LKYSPP has academic resources and research, teaching and global outreach, which IPS could complement with the strength and depth of its research and focus on Singapore-based issues of policy and governance, he said. IPS analyses public policy, examines issues of national interest and studies the attitudes and aspirations of Singaporeans through surveys on public perception. ESM Goh noted that it revamped its research programmes recently to delve into the management of diversities, income inequality and social mobility, the problems as well as opportunities of an ageing society, and the unique challenges of governing a city-state. IPS is well-poised to dive deep into these issues, he added. As Singapore heads into the future, Singapore's policy research framework should be dynamic, inclusive and integrated, he added. "How do we manage these changes and better the well-being of Singaporeans? How do we anchor our citizens to their country, rally and commit them to Singapore?" ESM Goh said. While the Government recruits some of the best to serve in the political leadership and public service, there are also plenty of able people outside the Government. He believed the Government would benefit from tapping their views and expertise. Whether from academia, the business, corporate or social service sectors, they "would be able to contribute to good governance", he said. This was the genesis of IPS.